Suzuki Motor Corporation has exciting plans to enter the midsize (D-segment) market in the third phase of its global strategy. At the 2007 International Motor Show in Frankfurt, Suzuki wowed the motoring public by signalling its midsize intentions with the Concept Kizashi. Then at the 2007 Tokyo Motor Show, Suzuki gave a further taste of its midsize production-car ideas in the form of the Concept Kizashi 2. 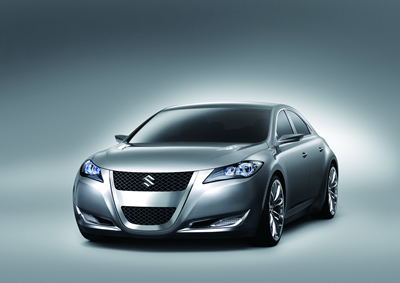 At the 2008 New York International Auto Show, Suzuki will be unveiling the culmination of its flagship preview series: a midsize sport sedan called the Concept Kizashi 3. Since launching the Swift in 2004, Suzuki has been pursuing a global strategy in line with its “Way of Life!” brand slogan. In the first phase of its global strategy, Suzuki focused on sportiness, launching the Swift, Grand Vitara, and SX4. In the second phase of its global strategy, Suzuki focused on family-oriented user-friendliness and environmental compatibility, launching the Splash and unveiling a design study for the subsequent Suzuki world strategic model. True to its spirit of innovation and challenge, Suzuki is now moving forward with the third phase of its global strategy — a phase in which it will enter the midsize segment through an initiative first highlighted by the Concept Kizashi at the 2007 International Motor Show in Frankfurt. The theme of this phase is “status”. Suzuki has made a name for itself as a specialist in compact cars and sport utility vehicles. It sold 2,375,000 vehicles worldwide in 2007, and its mid-term five-year plan calls for production of more than three million vehicles in the fiscal 2009. But even with its ongoing sales and production growth, Suzuki needs to expand its car lineup beyond the compact-car segment in order to make a further leap forward as an automaker and accommodate the diverse lifestyles of customers who want to stay with Suzuki when purchasing larger, midsize cars. The future production model will be built at Suzuki’s brand-new Sagara plant in Japan, currently under construction, and provide an accessible alternative to the near-luxury segment, and while a firm timetable has not been announced, Suzuki will deliver a Kizashi-influenced sport sedan to North American dealers in 2010. The Concept Kizashi series was developed by Suzuki’s Advanced Design Group to reflect a dynamic athlete in motion, taking design cues from a strong, honed physique while displaying the performance, strength and style befitting a flagship vehicle. The design theme began with Concept Kizashi, which made its debut at the 2007 International Motor Show in Frankfurt, and the Concept Kizashi 2, unveiled at the 2007 Tokyo Motor Show last October, which further revealed Suzuki’s new design language. The Concept Kizashi 3 represents the completion of the Kizashi series and provides a closer-to-production vision of Suzuki’s future sport sedan offering. The Kizashi’s “super sport” identity, a core component of the Suzuki brand DNA, is tempered by the vehicle’s overall mission to provide strong, refined urban performance. Evoking the physical superiority and dignity of a world-class athlete, the Concept Kizashi series was developed by Suzuki to create a substantial presence that redefines the traditional performance sedan and moves the Suzuki brand upscale. The overall design theme suggests physical strength from intense daily training, with the strong will, commitment and presence of a champion. Each of the Concept Kizashi series strikes a balance between driver comfort and sportiness, with roomy cabins melded to lean, dynamic exteriors. The hood and body style of all three Concept Kizashis hint at abundant engine power and wind-splitting aerodynamics, while the long wheelbase, aggressive wheel/tire combinations and abbreviated overhangs communicate a performance-oriented, energetic image. A powerful-looking body profile is incorporated throughout the series to convey underlying strength, with large wheels and a wide tread expressing a capacity for superior performance. Beyond its exterior architecture, the Concept Kizashi series constitutes a four-wheeled continuation of Suzuki’s exciting, performance-oriented motorcycle heritage, represented best by its dynamic, world-renowned line of GSX-R sportbikes. Those bikes, some two decades after their introduction, continue to dominate the sportbike segment and have achieved icon status. Suzuki is pursuing sporty performance in line with the focus on driving excitement that it has maintained since developing the Swift. And naturally, Suzuki recognizes a need to equip its midsize product with technologies that address the motor industry’s most pressing concern: the environment. With these priorities in mind for its midsize production car, Suzuki is considering possibilities to employee a viable hybrid system and a state-of-the-art clean-diesel system. Further, Suzuki plans to use its i-AWD technologies to combine all-wheel-drive freedom with the highest environmental performance among midsize cars. As with Concept Kizashi and Concept Kizashi 2, the front end of the Concept Kizashi 3 expresses strength and style, with sharply fashioned headlights that emphasize the sensation of forward motion. The vehicle’s exquisitely engineered body reflects Suzuki’s distinctive combination of capability and refinement, with power flowing from a 3.6-liter DOHC V6 engine with plated cylinders – a weight-and space-saving technology that evolved from the lessons learned by Suzuki’s motorcycle and WRC development teams. The body’s monochrome finish, Kizashi Silver, gives the vehicle a sense of composure and depth of character, with metallic paint sparkling to emphasize the dynamism of the body’s cross-section. With the debut of the Concept Kizashi 3, the future of Suzuki has begun.